The Beef: 75:25 meat to fat and a chuck heavy blend of chuck, brisket, and boneless short rib. Packed medium firm with a nice, coarse, hearty grind. It had a nice front note of funk, but it was certainly oilier than I was comfortable with. The Seasoning: Seasoned on the outside and left alone on the inside. 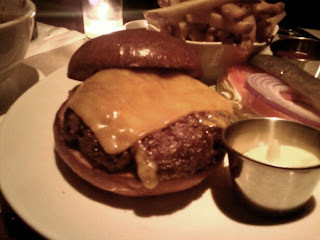 Sad...if a high-end burger is full of chuck, then it needs to be seasoned enough to generate some flavor. The Sear: It was pretty weak in its application to the irregular and medium thick patty on a reasonably hot grill. The sear was not especially crunchy, but it was vaguely present. The Preparation: Grilled, but I couldn't find the grill marks, a little beyond the Medium that was requested. I always order Medium for Chuck, or all that I get is bland. That was OK, since the beef was pretty bloodless. The higher cooking temp brought our more flavor from the Chuck. 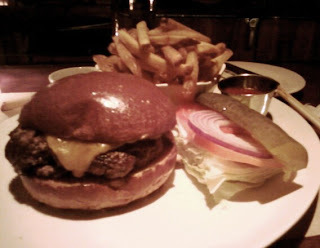 The Bun: A well-toasted, but overly greased and sweet brioche bun. 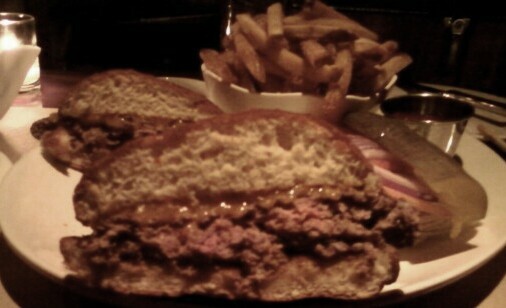 The bun was a little spongier than I would have liked, and as a result it was on the chewy side. 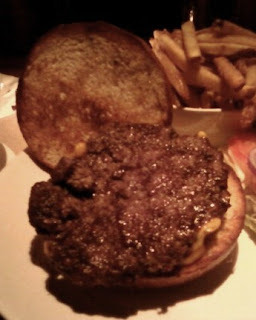 The Meat to Bun Ratio: The cheeseburger at Lure Fishbar is pretty hefty--around 7 oz., so the staunch brioche held up well to the mass of beef. The Fries: These were crisp and cooked in peanut oil. They were a little under-seasoned, but after a massive burger, who needed them anyway? The Value: Meh. It was good burger--it was also a $15 burger, so I had hoped for a little more that merely good. To wrap this up, Lure Fishbar is a seafood establishment. They quality of the seafood certainly rose above the beef. They opened a sister restaurant, which specialized in burgers, and that is the subject of the next review, which was conducted on the following day. Burger Review : Lure Fishbar delivered a competent and satisfactory cheeseburger.